The 2016 presidential election is around the corner, and if polls and predictions are right, it will be a close race. Contactually, a Washington, D.C., based CRM company, decided to get involved by launching a non-partisan email campaign encouraging its users to vote. The company will be providing email templates for its users to send out to fellow agents, clients and other community members. The templates are non-partisan and simply offer useful voting information. Contactually CEO Zvi Band says tech companies have the power to make large civic impacts, and the email campaign is the company's way of doing that. The presidential election is around the corner, and many voters are feeling ambivalent or downright apathetic about frontrunners Hillary Clinton and Donald Trump. And rather than choose what some call “the lesser of two evils” or vote for a third-party candidate, some Americans are simply deciding to not to vote at all. But for Contactually CEO Zvi Band, the last option simply isn’t good enough.
.@Contactually launched “Get Out The Vote,” a non-partisan email campaign. On Tuesday, Contactually launched “Get Out The Vote,” a non-partisan email campaign encouraging its more than 9,000 users to vote this November. Furthermore, the company is providing a non-partisan, pre-written email template that agents can send to colleagues, clients and other community members. 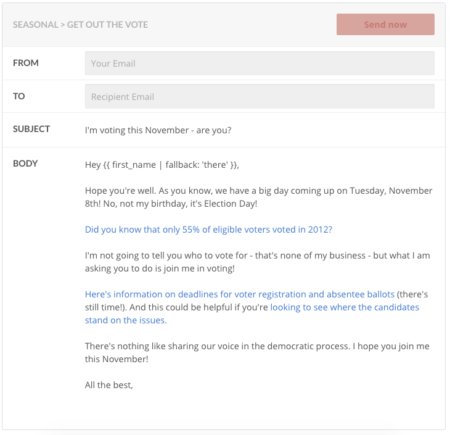 Contactually’s “Get Out The Vote” email template. Real estate agents who want to participate in the campaign can access the pre-written email in their Contactually template library at no charge. Furthermore, Contactually will provide instructions on how it sends the email out en masse with the company’s rapid messaging Scalemail feature. Agents who aren’t Contactually users can access the email at templates.contactually.com underneath the “Seasonal” category. Agents can send out their own email using a template created by @Contactually. Band stresses that the emails are non-partisan — they aren’t meant to campaign for a specific candidate. Instead, they are to be used as an education tool. The email template contains an interesting statistic related to voting, information on voter registration and absentee ballots and a non-partisan comparison chart of where the candidates stand on the issues. What the Contactually email looks like to the recipient. Lastly, Contactually employees will be given Election Day off so they can vote.
.@Contactually employees will be given Election Day off so they can vote. Band says he was inspired to launch “Get Out The Vote” by prominent venture capitalist Hunter Walk, who leads the “Take Off Election Day” campaign. He says he wanted to do this in 2012, but Contactually didn’t have the reach and the tools to get it done. Band says tech companies and agents are in the perfect position to make a large civic impact, and the election season is the perfect time to get involved.